The image of the variant looks nothing like any illustration that I have ever seen. However, I traced this image directly off of a Royal Hong Kong Yacht Club ensign that came directly from the club. I have seen photos of the badge displayed mid fly and lower fly quarter. About the emblem shown on the RHKYC: Was it used in the ensign/burgee previously - the design shown must be of latter more modern design. Beside the dragon, that older badge includes a ribbon with RHKYC name inscribed and five hills. I think the emblem at the website is/was used only for other purposes. I think that it once graced the entrance of the club and it has certainly been used on letterheads, websites etc. With that said, I'm under the impression that the image that I have sumitted was the ensign/burgee badge for some time. However, I do not know that for certain. This arrangement though would not be unique among British yacht clubs. I have seen maybe 3 or 4 other instances where a club's ensign badge and its badge used for other purposes were a bit different. 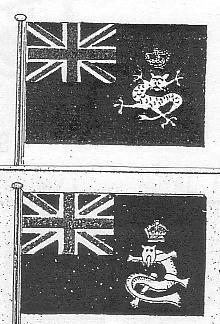 I'm still researching the 2 flags in the old picture. I think the one on the viewers right is simply an undefaced British.